What are the products sold at Notepadsdirect.com? At Notepadsdirect.com, we sell various types of best-selling promotional notepads such as Sticky Pads, Custom Scratch Pads, Memo Cubes, Flags, Spiral Notepads, Custom Memo Books, Magnetic Notepads, Envelopes and Low Quantity Items. Do you only sell what is listed on your site? No, we sell not only what is listed on the website but we have also we have tried to include varieties of popular promotional notepads. If you can’t find what you are looking for, give us a call at 855-866-8372. 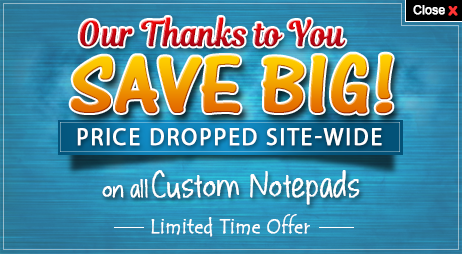 How can I shop at Notepadsdirect.com? At Notepadsdirect.com, we have organized products under different categories on the left hand side of the screen. Also, customers can shop customizable scratch or notepads and sticky pads from Order by Size (if they are sure about the size of notepad they wish to purchase) and Shop by Design. How should I submit my artwork at Notepadsdirect.com? You can upload the artwork at the ordering page in the checkout section under the title upload artwork or email it to us at . What are the accepted file formats at Notepadsdirect.com? We accept vector artwork in file formats such as .AI, .PS, .PDF, .EPS or JPEG format. If the file is in JPEG format keep the image in less than 600dpi. What things should I take care, while sending the artwork? Artwork and images should be in format that is specified by us under the Art Specification Section. There should be enough space left at edges so that important information is not missed or cut at the edges. We expect you to leave at least 1/8th margin at the edge of each design. Fonts should be converted into curves/outlines. Best quality prints are produced from high quality images. Bitmaps should have a resolution more than 600dpi. Avoid creating designs with borders at the edges of the artwork. Will you retain my artwork for a long time? Yes, we do retain an artwork for a long time. It will be retained in our archives and product repository. How should I proceed with my order at Notepadsdirect.com? Add to Cart - You will see add to cart icon below the product. Click on that to add your product to shopping cart. Proceed to Checkout - Click on Proceed to Checkout and you will get into the Login page. You can enter your existing user id and password or select the Express Checkout option. If you are a new customer, don’t forget to create an account. Delivery and Payment Options - Edit your shipping and payment address, if there are changes or else proceed with your order. Shipping Methods - Select your preferred shipping method from FEDEX ground (3-7 business days), FEDEX 2 day and Standard Overnight. Payment Method - Select your payment method – Debit card/Credit Card, PayPal and Pay after Approval of Artwork. Upload Artwork/ Get Free Design - You can upload your artwork in any of our specified formats or request a free design. Completion – A confirmation mail will be sent to your registered email id. What are the charges associated with my order? With each order, you will see price components that are calculated on the basis of ordered quantity. The minimum ordering quantity is pre-set and you cannot order lesser than that. The item price and total price is displayed on the screen. The shipping charges are added in the later stage when you select the appropriate shipping method. The sales tax of 6.75% is added to the final charges (counted after selection of shipping method) if you are residing in the state of North Carolina. *Our prices may change without prior notice. Do I have to pay extra if your prices change after my ordering? No, you don’t have to pay anything extra if your product is already under production. If your product is still lying in the shopping cart, you may be required to pay extra. Can I receive rush orders? We don’t offer rush orders because notepad printing is a complex process. Can I pay after receiving the order? No, we only go into production after accepting the payment. You have provision to pay after the design approval. How can I pay for my purchases at Notepadsdirect.com? We accept American Express, Visa Card, Pay Pal and Debit cards. Yes. At notepadsdirect.com, we have used the latest encryption technologies to ensure safety of the payment information entered. It will depend on where you live. If you are living in North Carolina, you are required to pay sales tax of 6.75% along with product charges. The sales tax is not applicable to citizens of other states. For any queries regarding the sales tax and tax exempt status, you can contact us at 855-866-8372. Can I order less then 250 note pads at a time? Different products have different minimum quantities, some are less then 250 and some are more. For low quantity requests, we do have a category of low quantity items. For large quantity requests, please call us at (855) 866-8372 for a custom quote! At this time, we cannot fulfill orders below the listed minimum quantities. Can I order more than 50,000 note pads at a time? Yes. Please contact us for orders of 50,000 pieces or more at 855-866-8372! How many sheets can I order per notepad? Each product has fixed sheet sizes. Mostly you will find 25, 50 and 100 sheet notepads. So you can order only sheet sizes available with each product. If you need help sorting out the best product for you, please call one of our advisors at 855-866-8372! I received a lower quantity of notepads than what I ordered, what can I do? It is quite unlikely that you receive an order lower than actual ordered quantity. If this happens you can contact our customer service department by phone at 855-866-8372 or write to us at . I received more notepads than I ordered, do I owe you money? Absolutely not! Sometimes our machines print over the amount that the customer orders. In those cases, we ship those extras out to you free of charge! Is it possible for me to cancel the order in the production stage? No, we cannot accept your request for cancellation once the order enters into the production stage. If you want to cancel your order, contact us as soon as you make the payment or give approval to the online design proof offered by us. Can I get a free sample for the product that I wish to purchase? We offer free samples based on the availability. To request a free sample, call us at 855-866-8372. Do you ship outside USA? No, we only ship within the contiguous USA. Production times vary depending on ordering quantities and the types of products purchased. You can see production time by clicking on the ‘Specifications’ tab with standard turnaround time. Also, you can select your preferred shipping method on the payment page to fasten the process. Yes. When an order is shipped to multiple locations, the largest order charge to one location will be considered as free shipping. There will be extra shipping charges to any additional location. Can I receive my order faster than the mentioned production or delivery times? Yes. We follow the shortest turnaround time in the industry. We will ship the order as soon as we finish the production. Can I raise claim for a price match on a product that I recently purchased from Notepadsdirect.com? Yes, you can raise the claim for a price match. For more details on price match guarantee, check our price guarantee section. What information should I enter to purchase from you? What are the security measures taken to ensure privacy of my information shared with you? What are the terms and conditions for purchasing from the Notepadsdirect.com? All our terms and conditions of business with Notepadsdirect.com are mentioned at Terms and Conditions. It is highly recommended to read the document before proceeding with your order. How should I contact customer service department at Notepadsdirect.com? You can also contact us through a Contact Form.